Photo provided. The ladder on Oak Harbor Fire Department’s ladder truck is out of commission and needs repairs. The Oak Harbor Fire Department’s ladder truck will be heading to the Midwest for some TLC. During a city council workshop Wednesday, Fire Chief Ray Merrill laid out some options for dealing with a cracked-up ladder on the department’s sole ladder truck. The city could buy a fancy, new $1.2 million ladder truck, retrofit the current truck for $500,000 or refurbish it for about $150,000, he said. In the end, the council agreed to the least-expensive option of refurbishing the truck, which will buy the city about five to 10 years of use. At some point, however, Merrill said, the city will need a replacement ladder truck as well as replacements for two 20-year-old engines. He said he will develop a plan for replacing the trucks, which could mean bonding or grants. 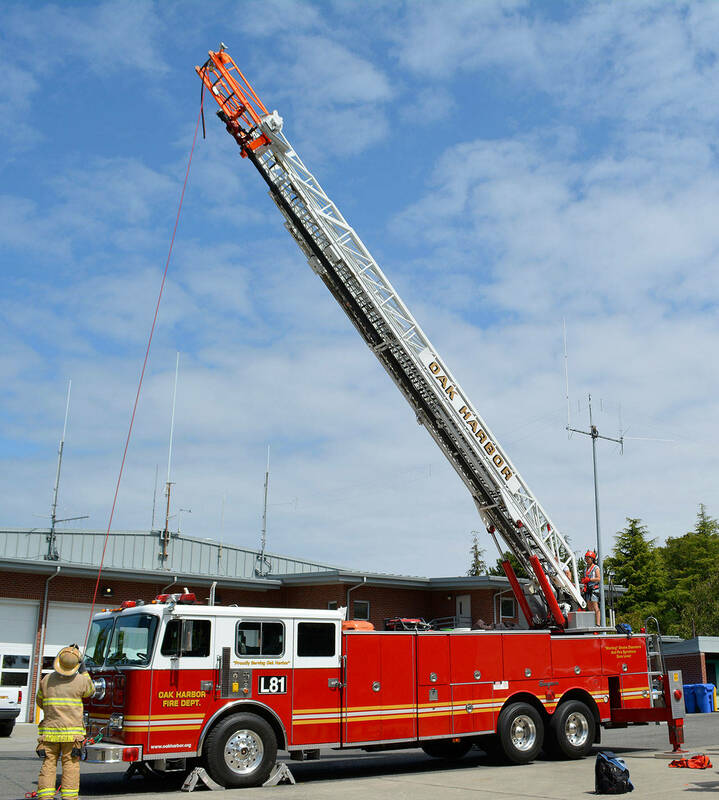 City Administrator Blaine Oborn suggested that the city bond for a quint, a smaller apparatus which serves the purpose of both an engine and ladder truck, and a single engine. He said the department could get by with one less engine. The fire chief explained that the city purchased the ladder truck in 1992, and it has only 16,680 miles on it. But the ladder is currently out of service, he said, because an annual inspection found numerous cracks on the 100-foot aerial ladder. The Navy’s ladder truck had to respond to a recent structure fire on South Whidbey. The ladder hasn’t been in frequent use, Merrill said, but it is invaluable when it’s needed. In recent years, for example, it was used to rescue a paraglider out of a tree, rescue someone from a third-story window and attack house fires from above. Without a ladder truck, the city could lose its “class 4” insurance rating, which would increase insurance premiums for homeowners, the chief said. Merrill said the ladder truck will be placed on a lowboy tractor trailer and trucked to Wisconsin for the repairs. He cautioned that there’s a chance an inspection will show that refurbishment isn’t possible, at which point the city will have to reevaluate options.